Can 45 lc ammo be fired in 45-70 rifle? With expense and scarcity of 45-70 ammo and brass, was wondering if 45 lc ammo will work in sharps type rifles chambered for 45-70? Like 45 schofield works just fine in 45 lc revovlers. Rather ask first rather than experimanting. Thanks to those who share their knowledge and opinions. The short answer is NO. .45Colt is either .454" dia., or .452". Whereas .45-70 is .457" to .458"
In addition, the rim and case dimensions are significantly different. I don't have the databook in front of me, but I think the rim diameter is totally wrong. 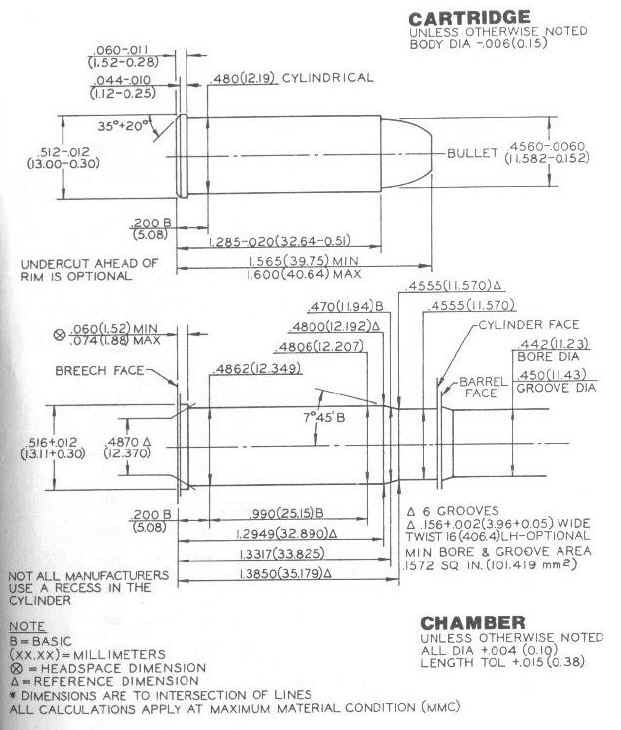 In addition, even if it was right, and the cartridge fit the chamber tight, the bullet would have to travel over an inch before it engaged the rifling in the barrel. That would be bad for accuracy, not to mention resulting in a HUGE buildup of lead at the entrance to the barrel. Not a good idea! Griff beat me to it AND WITH THE DATA! Way to go! No, not even if you tried to make an adapter case, like what allows .30 carbine to be fired in 308 or 30-06. 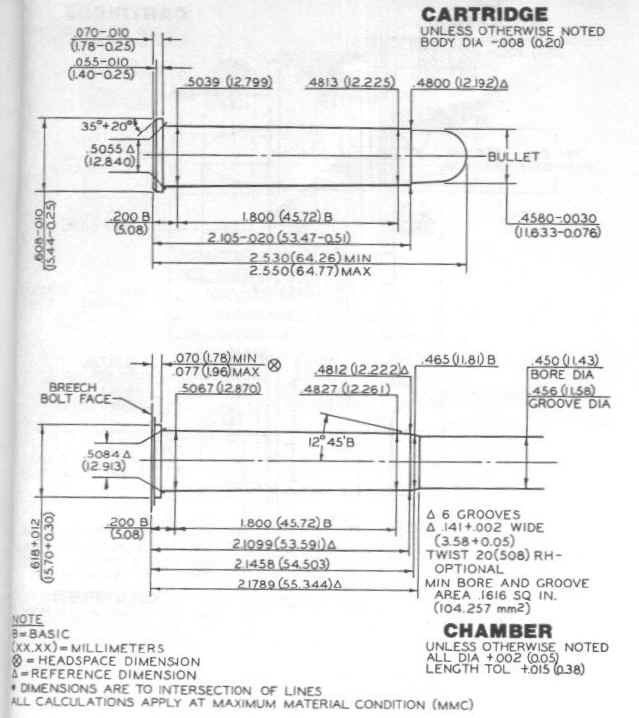 Bore diameters, as shown by the SAAMI diagrams, are way apart. With lead bullet reloads, it can be within a few cents of just as cheap to shoot 45-70 as 45 Colt. A problem looking for no solution. The 45 70 has a rim diameter of .608 and a base diameter of .505. The 45 Colt has a rim diameter of .512 and a base diameter of .480. The 45 Colt would probably fire in the 45 70 but it would split the case. Also, 45 Colt bullets are .452 and 45 70 bullets are .457 so the accuracy would be bad to say the least. Thank you for asking this question. I have often wondered about this very thing. Rather ask first rather than experimanting .experimenting. Slim, I really wish you would have experimented - putting both rounds next to each other with a set of calipers in hand or try putting a 45 Colt in a 45-70 chamber. You would have made one less post! Both calibers were invented a year apart: 1872 and 1873. If the Colt, handgun cartridge, could have been chambered in the 1873 Springfield 45-70 rifle chamber, don't you think the firearms manufacturers would have been advertising about it for 140 years? Your response is stereotypical of what one would expect from someone from Jersey! Fortunately, I know many folks from Jersey who are gracious, who try to be helpful, and who do not insult people with less knowledge than themselves. John Boy is (normally) a nice guy with lots knowledge that he shares freely. You either hit on a pet peeve with your question or he is having a really bad day. Brooklyn Slim, your question is a valid one and one that our calvary soldiers tried in the 1870s and 1880s. This is two completely different cartridges that just sound similar. This lack of forethought poses a bigger problem with the .44 S&W Magnum and the .444 Marlin. That was a case of could of/should of. There is plenty of information about loading the .45-70 online from 'knoweldegable' cowboys, reloading suppliers and honorable publications like Handloader and Rifle. I would heck-of-a-sight rather see folks ask the question than perform those experiments. Perhaps the questions and companying answers may save someone else serious problems in the future. We do not want to say anything that might discourage the questions! All the soldiers at Calvary were Roman. May have been some cavalry there, also Romans if there. I would heck-of-a-sight rather see folks ask the question than perform those experiments. Bob, between the Internet links for caliber dimensions, a set of calipers and a 45 Colt case, a 45-70 case with a 45-70 rifle ... one learning themselves is more long term academically beneficial and less embarrassing than posting such a question and be "insulted' by me! BTW, one doesn't even need a set of calipers, the 2 different cases and a 45-70 rifle. All they have to do is use their Internet browser and ... Read! Was it a dedicated 45-70 shotshell they used back then in the "forager" trapdoors or a 410? Was the 410 even around then? Wait a minute seems I remember reading once they used a special barrel, thinkin' it was a 20 gauge maybe?? I just started CAS, and have all of 3 matches under my belt. There were side matches for various skills at the Maryland State Championship in Damascus, MD, one of which was long distance rifle. I was intrigued by the rifles, especially the Sharps, and began looking into various rifles. 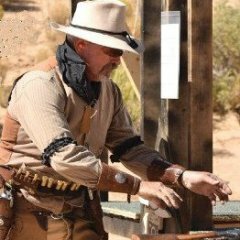 Having recently dumped a pile of dough (for my retired income based budget) in revolvers, lever rifles, and shotguns for my wife and myself, plus Dillon reloading equipment and associated supplies, jumping into another category mandated some thought and advice. No point in buying a rifle that I couldn't get supplies or ammo for. So why ask a stupid question, embarrasing myself, and wasting the time of some folks on the SASS Wire? Some things I did figure out, like why .357 mag and .38 special can be fired from the same revolver and rifle. Like .45 lc and .45 schofield from the same revolver. And 44 mag and 44 special, etc. Then I noted a gunsmith that developed a mod for the 1873 rifle that would allow a .45 ACP round to be fired from a rifle chambered for .45 lc. And the mod developed that would allow the Cowboy 45 Special to be fired from the 1873 rifle. Then I saw Taylor Had a Spencer chambered in .45lc. 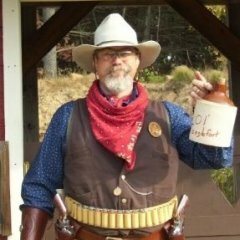 So I thought there might be a "NO,.....BUT" type of answer where a creative Cowboy had a way to do it, albeit in less than optimal (poor for long distance, but kinka OK at shorter ranges), which would allow one to shoot a cool rifle with stuff he already had. Like maybe a sleeve that the .45lc cartidge could slide into and be loaded into the rifle. Kicks and giggles with .45lc rounds (I understand a full load, or +P .45lc is a heavy load), and serious stuff with 45-70 rounds. Anyway, that's why I asked the stupid question. One of the top NRA BPCR shooter is Brian Chilson. This is his 2nd year as Overall Match Champion at the Raton, NM BPCR match. He has a Lee Shaver in his 45-70 and practices shooting silhouette chickens at 200 meters. Brian told me during the off season he shoots 10 to 12,000 rounds of 22's in his 45-70. So an option is - buy a 45-70 single shot rifle and the 22LR insert. Next step is set aside some of the children's inheritance and when 45 brass is available again - buy 100 cases, the dies, if not a caster, bullets and a set of globe front and vernier sights. Then in the meantime, enjoy shooting the 45-70 with accuracy out to 200yds (not legal though for SASS side matches with a 22LR though). Look around on the Internet for a used CPA Stevens, much cheaper, and then get a barrel caliber(s) of your choice like the 38-55 in addition to 45-70. Be fore warned though - the kid's inheritance being retired will be in jeopardy. I know this for a fact - it is addictive buying different single shot rifles! Slim, I forgot about this ... you want to shoot 45 Colt bullets is a 45-70 rifle. right? It is neither safe nor accurate to shoot .45 Colt in a .45-70 chamber-that being said-I have seen it done and in the event of a disaster and a situation where you only have the .45-70 rifle and the .45 Colt ammo it can be made to function as a single shot and that is the only time I would consider trying it. It is a desperation move only to be used when all other options fail. Yup, I'm guessing if them indians got you surounded and the only thing you have left is 45 LC ammo and a 45-70 rifle, you aint gonna worry so much about leading up the barrel!